International arbitration, once a second choice to litigation for private dispute resolution, is now conclusively the most preferred form of dispute resolution for cross-border disputes. In a new study published today by Queen Mary University of London (QMUL), in partnership with global law firm White & Case, 90% of the 763 respondents surveyed prefer international arbitration to resolve cross-border disputes, a finding which has increased significantly from QMUL’s first international arbitration survey in 2006, where the figure was 73%. 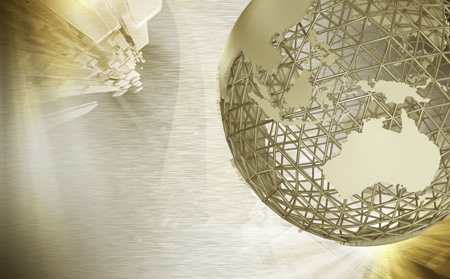 Parties now embrace international arbitration thanks to the greater enforceability of arbitral awards, the ability to avoid specific legal systems yet choose arbitrators, and the inherent flexibility of the process, among other benefits. 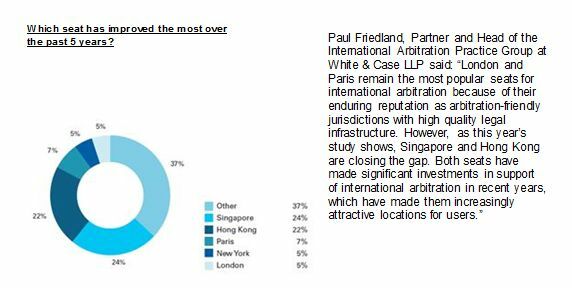 London and Paris continue to be the preferred venues for international arbitration, ranked by respondents as the two most used seats over the past five years (45% and 37%, respectively) and the two most preferred seats (47% and 38%). However, the study shows that Hong Kong and Singapore are gaining momentum, coming in third and fourth. Singapore is perceived to be the most improved seat for international arbitration over the past five years, with Hong Kong following closely behind. 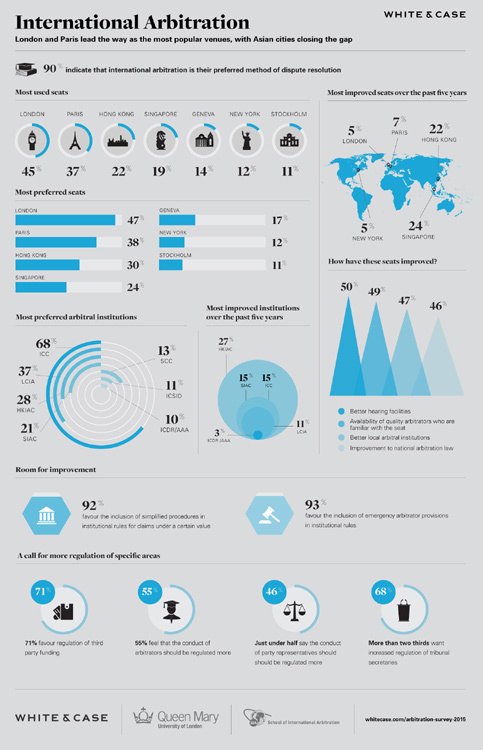 When respondents were asked to choose their three preferred institutions, just over two-thirds (68%) included the International Chamber of Commerce (ICC) in their answer, and more than one-third (37%) included the London Court of International Arbitration (LCIA), mirroring the results from the 2010 International Arbitration Survey. The Hong Kong International Arbitration Centre (HKIAC) and the Singapore International Arbitration Centre (SIAC) came in third and fourth (28% and 21%, respectively). The Survey revealed that institutions are primarily chosen due to their high level of administration, neutrality/internationalism and ability to administer arbitrations worldwide. A hot topic among users of international arbitration is the extent to which it requires greater regulation. While 70% of respondents felt that there is an adequate level of regulation in international arbitration in general, a clear majority believed that more ‘micro-regulation’ is needed when it comes to third party funding (71%), tribunal secretaries (68%) and the conduct of arbitrators (55%). Respondents believed that the most effective way to regulate third party funding is through guidelines, such as those issued by the International Bar Association. A majority of respondents also thought it should be mandatory for claimants to disclose the use of third party funding (76%) and the identity of the funder (63%), but only 27% thought that the full terms of the third party funding arrangement should be disclosed. The scope of the role of tribunal secretaries was something respondents expressed concern over, with an overwhelming majority showing preference for tribunal secretaries to undertake only those tasks which are neither substantive nor related to the merits of the dispute. 70% of respondents thought the most effective way to regulate tribunal secretaries would be through arbitral institutions. To reduce the time and cost associated with international arbitration, 92% of respondents favoured inclusion of simplified procedures in institutional rules for claims under a certain value. A requirement that “tribunals commit to and notify parties of a schedule for deliberations and delivery of final award” was particularly welcomed. The phenomenon of “due process paranoia” was also raised as one likely cause of increased cost and delay. Many felt that the risk of a successful challenge to an arbitral award was insufficient to justify arbitrators’ overly cautious behaviour. As such, respondents felt that arbitrators should be more willing to manage proceedings decisively. Some 93% of respondents favoured the inclusion of emergency arbitrator provisions in institutional rules. This is despite the fact that nearly half (46%) would currently elect to have recourse to domestic courts if in need of urgent relief before the constitution of the tribunal, whereas only 29% would opt for an emergency arbitrator. Users thus prefer to have a wide range of options available to them, regardless of how often they may elect to use them.